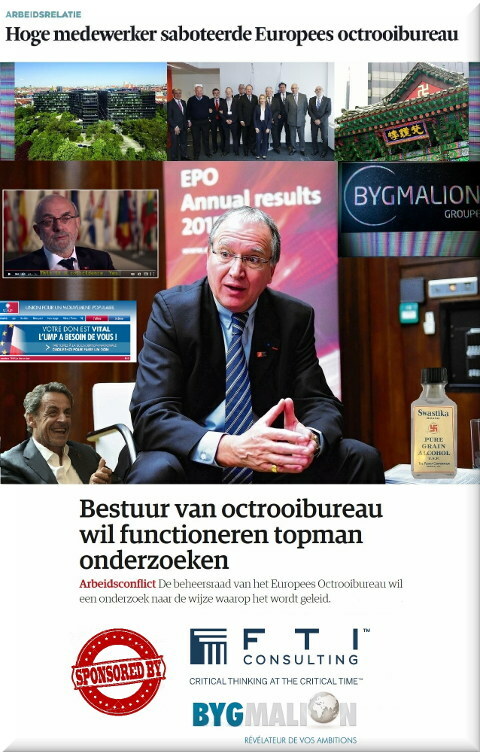 THE EPO‘s control of the media (not just European media) follows the FTI Consulting contract (US firm). Battistelli’s control of the media, a subject we shall elaborate on later in the week, should make everyone disgusted and should become a scandal in its own right. More Battistelli puff pieces for him and his goons now appear in the Indian press (as of last night [1, 2]) and nothing is said about the possibility that Battistelli will get sacked later this month. The attached satirical “collage” borrows some headlines from Dutch newspaper articles. The English translations are as follows. Governing body of Patent Office wants to investigate the actions of the CEO. Industrial conflict: The Administrative Council of the European Patent Office wants an investigation into the way in which it has been managed.